The weather here in Philadelphia the last couple of days doesn’t really feel like Fall. Mother nature needs to get with it. Anyway I am ready for comfort food. Filling the house with warmth and delicious baking and soups. I started by making out some pumpkin cookies, but it just looked so boring (haha). So I went ahead and jazzed it up with a cream cheese filling. To make it a little more fall like I added a couple drops of food coloring and even some sprinkles. You can make these as small or as big as you want. This would work great for kids birthdays or even those bake sales at school. Enjoy! In a large bowl, mix together flour, salt, baking powder, baking soda, cinnamon, ginger, and cloves; place to the side. In another bowl, whisk together brown sugar and oil until well incorporated. Add pumpkin puree and whisk together. Next add eggs and vanilla. Mix 1/2 of flour mixture over pumpkin mixture and whisk, then take the other half and do the same. Fold and mix everything together until everything is well incorporated. Take a tablespoon or in the case I used an ice cream scoop. Drop onto baking sheet. Bake cookies until they crack on top and a toothpick comes out clean when placed in the middle of the cookie. Should take about 15 to 20 minutes. Let cool on rack before filling with cream cheese. While the cookies are cooling you can start your filling. In a medium bowl using an electric mixer mix butter until smooth. Add cream cheese to butter and beat. Sift confectioner’s sugar and beat again. Add food coloring now if you would like and mix. Once done you can start to fill cookies. i want this with a glass of cold milk…now! These look delicious! I love the fall sprinkles, so festive! 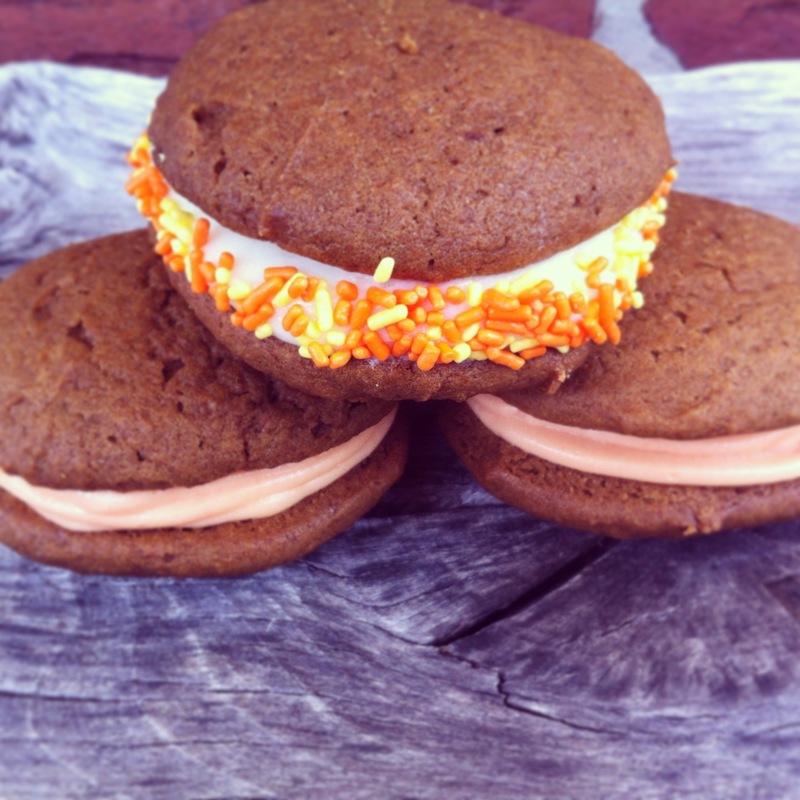 I need to make these and introduce my kids to the wonder that is the whoopie pie!